Everything you need to reach your next big idea – and seriously impress those clients. 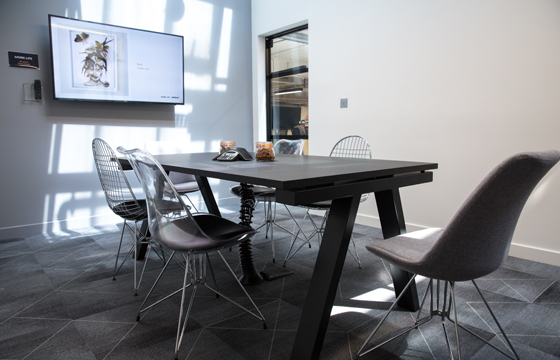 Our meeting rooms in Clerkenwell, near Farringdon station, boast a spiffing bright and modern design and come decked out with whiteboards, TVs, phone conferencing, ninja-fast WiFi, unlimited snacks and endless productive vibes. If you don’t know what an Eames chair is, you will do now – this 6 – 8 person meeting room celebrates Charles & Ray Eames with an array of chairs and designed wallpaper to match. Lots of natural light, a TV, conference phone and whiteboard – help yourself to tea/coffee and our 1GB Ninja-fast WiFi powered by Verizon. 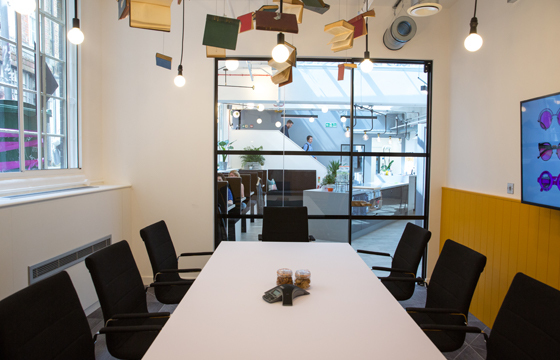 Drawing inspiration from the local Clerkenwell area, famous for design and bookbinding, this beautiful meeting room features books hanging from the ceiling. Able to fit up to 8 – 12 people, with comfy, reclining chairs, conference phone, a TV and whiteboard this room will get the creative juices going for sure!